to life in Maybole at a special ceremony in the Town Hall. David Kiltie, Chairman of Maybole Community Council, welcomed them, and their families and friends, saying, "Tonight is another very special occasion for Maybole Community Council when, again, we pay tribute to a number of very special people." Mr Kiltie added, "Everyone being presented with a "Scroll of Appreciation" tonight has been nominated by others in the community, and the community council is delighted to acknowledge the contribution they have made to the quality of life in Maybole." Before the presentation, Councillor Andy Hill, leader of South Ayrshire Council, paid tribute to Maybole Community Council for the preparation, planning and research that had gone into the occasion. "The excellent idea of making awards to local people for their contribution to the town came to fruition last year," he said, "thanks to the inspiration of Maybole Community Council and the financial support of South Ayrshire Council." He continued, "In this special Millennium year, my Council is delighted once again to provide the funding to enable the creation of the scrolls, and the holding of tonight's event. Councillor Hill said he was present to demonstrate the Council's, and his own personal, support for the event. He described it as "this excellent initiative, which proudly recognises those from Maybole who have recorded outstanding achievements in service to the community." Addressing those who were to be awarded scrolls, he said, "Whether it be by devotion, commitment, or duty, each of you has performed a service for the benefit of the community in a manner which reflects highly, not only on your own self-esteem, but on Maybole." He continued, "I congratulate each and every one of you. Without a doubt, you have demonstrated that you are worthy of public recognition in the best manner that Maybole, and its community council, can bestow." 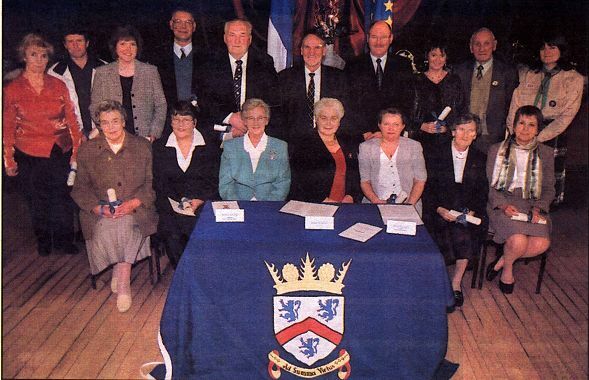 Councillor Hill then presented scrolls to Jacqueline Boughen, Sam Coulter, Rosemary Eccles, Senga Fergusson, Anne Findlay, Janet Graham, Ellen Hawkes, Deborah Hearton, James Hearton, Christopher Jackson, Margaret Kenny, William Kenny, Roger Martin, Agnes McCreadie, Janetta Rodger, Isobel Seymour, Denis Ward. Mr Kiltie thanked South Ayrshire Council officials and members, especially Councillor Hill, for their support and assistance; everyone who nominated individuals; Jane Dunlop, Florist; those on the independent panel who gave a great deal of consideration to all the names; and James Brown, of Baltersan, for his work in producing the scrolls.